enorton [at] ipcmemphis [dot] org or (901) 685-8206. IPC members Avery and Marilyn Bridges served as full-time missionaries to Bogota, Colombia. Now back in the States, they’re taking a team of 12 to serve for a week alongside other missionaries. Activities include small maintenance construction projects, working with street children, and teaching conversational English to RUF students. Approximate cost: $1,800. Contact Avery, papabayou [at] gmail [dot] com. Construction trip for women and men to San Juan, Puerto Rico, to help Hunger Corp with the rebuilding of homes devastated by hurricanes one year ago. Cost to be determined. Contact Matt Olson, matt [at] noblesolson [dot] com. Rev. Mike Malone is planning another adventure in Tanzania that includes medical, pastoral study, and women’s Bible study components. Participants will have an opportunity to take a safari. Watch for more details in January. Approximate cost: $3,500. Contact Mike, mmalone [at] ipcmemphis [dot] org. dkilgore [at] uhsweb [dot] com. edafferner [at] gmail [dot] com. Don Ray is planning to take another group of men to conduct a Christian leadership conference for local businessmen in the Nassau area. 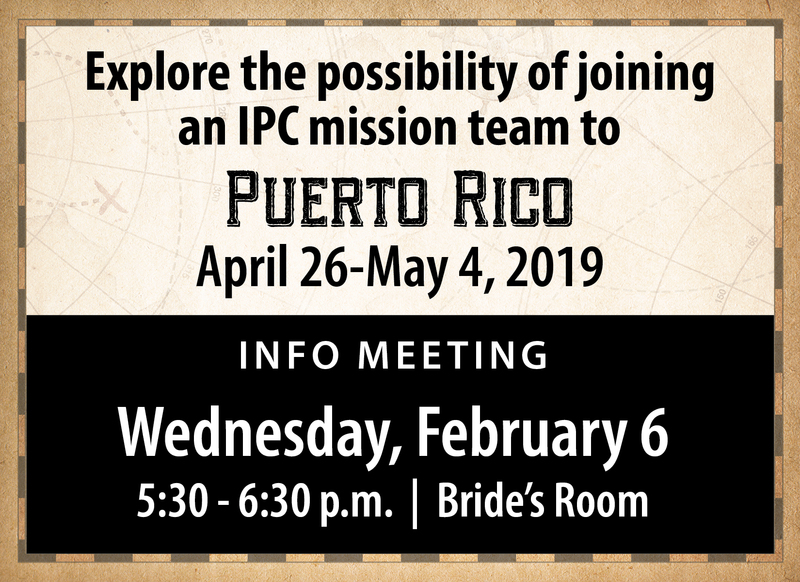 The seminar will aid a long-time ministry friend of IPC, Julian Russell, as he and his wife strive to plant a church in his home country. Cost to be determined. Contact Don, dray38138 [at] gmail [dot] com. 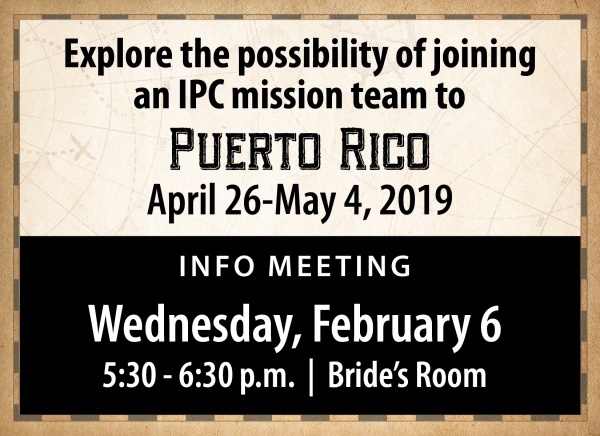 Any member in good standing who desires to share the Gospel of Jesus Christ is invited to go on a mission trip through IPC. The Short Term Missions Committee will give partial financial help if a person is unable to pay the full fare to go on the trip. Please contact the leader if you are interested.